Weekly Standard: The Chinese Crackdown Continues In the midst of a perceived trend toward religious tolerance, Chinese crackdowns on Christians in recent months have shocked many. But Meghan Clyne of The Weekly Standard argues that the regime has always subverted religious freedom and at the same time increased Christian's dependency on the state. Cardinal Joseph Zen Ze-kiun, Archbishop of Hong Kong, receives the biretta cap from Pope Benedict XVI , March 24, 2006. Ze-kiun has criticized the Chinese government in its handling of Christians. Meghan Clyne is the managing editor of National Affairs. Communist China has earned praise in the past few years for a perceived thaw in its strict opposition to religious observance — particularly Christianity. A visitor to China will see Christian churches out in the open; a printing facility in Nanjing is the largest Bible publisher in the world. There is the appearance, at least, of a faith that is free and tolerated. This helps explain some of the shock over a series of brutal crackdowns that have come as startling departures. Over Easter, Chinese authorities escalated their campaign against a Protestant "house church," Shouwang, detaining dozens of believers and placing hundreds more under house arrest for the "crime" of worshipping in a public square. And late last month, the U.S. Commission on International Religious Freedom (USCIRF) released its annual report, which flagged several incidents of horrific abuses of Christians in China​ — ​including "disappearances," beatings, the destruction of churches, and forced "re-education through labor." But these two trends are not in fact contradictory. The "thaw" in China's treatment of Christians was nothing more than a savvy and sophisticated new twist on its longstanding assault on religious freedom. While scaling back on bloody crackdowns that stir international condemnation, China has found subtle ways of undercutting independent churches and quietly preempting the spread of free religion. Indeed, the commission's report notes that "Chinese officials are increasingly adept at employing the language of human rights and the rule of law to defend repression of religious communities." This insidious approach to religious oppression is no less dangerous to Christians. In fact, it may be more so: As Joseph Cardinal Zen Ze-kiun, the former bishop of Hong Kong, said during a visit to Washington in April, "Torture, abuse​ — ​that is easier to shout about." The state's policies weaken Chinese Christian institutions by dividing them. "Official" churches, managed by the government, operate in the open. Meanwhile, "underground" or "house" churches​ — ​those that refuse to, say, hand over the names and contacts of their worshippers or disavow all loyalty to foreign parties (e.g., the Vatican)​ — ​frequently operate in secret. When they are caught by the regime, brutal punishment is often the result. Religion is thus permitted only insofar as it advances the aims of the state. As the head of the State Administration of Religious Affairs, Wang Zuo'an, explained: "[T]he starting point and stopping point of work on religion is to unite and mobilize, to the greatest degree, the religious masses' zeal, to build socialism with Chinese characteristics." Often, the main instrument in this campaign is money. The USCIRF report notes that Beijing is permitting certain religious communities to hold property and accept donations from overseas. The catch, however, is that these rules apply only to registered religious groups​ — ​those willing to affiliate with state-controlled churches. The Chinese government also subsidizes educational expenses and foreign travel for clergy​ — ​but again only for those who belong to "approved" churches. Even rebuilding after disasters is fair game: A Catholic who frequently works in China tells of how, in the aftermath of the 2008 Sichuan earthquake, several Catholics in Hong Kong moved quickly to raise $900,000, with the aim of rebuilding Catholic churches. But "before the money could be deployed," this would-be benefactor explained, "the government had come in and more than fixed the churches, in fact making improvements. The results, while good, were undertaken in order to undercut the [Catholic] church and allow the PRC to push aside outside help." The sum effect of these activities is to increase Christians' dependence on the state, and thus to increase the government's leverage. As a human-rights lawyer and director of the Hudson Institute's Center for Religious Freedom, Nina Shea, notes, "It's a way of bribing and driving Christians to play the game according to Communist party rules." Threats and intimidation, too, play a role. Cardinal Zen noted the case of Bishop Feng Xinmao, who resisted attending the Conference of Chinese Catholic Representatives convened in Beijing in December to select new leaders for the government-controlled Catholic "church." According to Cardinal Zen, "more than 100 police" were dispatched "to ensure that the bishop [went] to the meeting." The man selected at the conference to head the state-run Catholic organization was Ma Yinglin — a bishop named by the Catholic Patriotic Association (the "official" Catholic church) in 2006 without Vatican approval. The USCIRF notes that Ma was also at the center of a controversy surrounding the April 2010 ordination of another, legitimate bishop, Paul Meng. Bishop Du Jiang — who is recognized by the Vatican — resisted attending Meng's ceremony because Ma would be present. As the USCIRF report states, Bishop Du was later placed under house arrest. And in January, the State Administration of Religious Affairs released its priorities for managing religious activity in 2011. According to a translation and analysis made available by the Congressional Executive Commission on China, the objectives include "guiding" Protestants who "participate in activities at unauthorized gathering places" to worship instead at churches controlled by the state. How exactly that "guiding" would occur was left to the imagination. China's restrictions on education and speech effectively snuff religious activity. Shea, who is also a USCIRF commissioner, describes a "web of regulations controlled by avowed atheists": restrictions on minors' being educated about faith; bans on preaching against abortion; prohibitions against teaching, discussing, or debating issues central to Christianity​ — ​topics like Creation or the Apocalypse. "When there's a conflict between the faith and morals of the Christian church and Communist government policy," Shea explains, "Communist government policy wins out." The regime has also sought to interfere with church management and administration​ — ​especially in the case of the Catholic church. In 2007, Beijing and Rome reached an accord whereby the Holy See would be allowed to approve and ordain bishops who had been vetted and selected by the Catholic Patriotic Association, thereby allowing bishops to affiliate with Rome openly (an estimated 90 percent of CPA bishops and priests are believed to have been secretly ordained by the Catholic church). The upside, at least for Rome, was a reduced likelihood of schism. But in November 2010, the CPA named Guo Jincai as bishop of Chengde without Vatican approval​ — ​a move that has drawn considerable anger and concern. "I have seen it with my own eyes," Zen said. "Our bishops are being humiliated." Yet even when the Holy See does condone ordinations, as long as the government controls who becomes a member of the clergy, there is always a risk of divided loyalties and a high danger of infiltration. During his visit to Washington, Cardinal Zen lamented measures that had been taken within the Vatican itself​ — ​particularly regarding a 2007 letter from Pope Benedict XVI to Chinese Catholics. Zen says that a Belgian priest working in the Vatican, Father Jeroom Heyndrickx, played a role in mistranslating the letter into Chinese. The translation circulated in China urged Chinese Catholics to come out into the open and affiliate with the CPA; the pope's original intent in the letter, Zen says, was the exact opposite​ — ​he was issuing a warning to "underground" Catholics about the likelihood that joining the "official" church would require them to contravene Catholic teaching. Some within the Vatican, Zen says, have pursued a policy of Ostpolitik, being too willing to compromise with China, whatever the cost. Such a policy is not without precedent, of course. In the second volume of his biography of Pope John Paul II, The End and the Beginning, George Weigel discloses that the Vatican reached a similar accord about the nomination of bishops with Communist Hungary in the 1960s. Its reward? For over two decades, the Hungarian bishops' conference in Rome became a wholly owned subsidiary of the Hungarian state, its clergy serving as agents of Budapest and Moscow. Representative Chris Smith, a New Jersey Republican who works extensively on human rights in China, argues that Beijing is determined to go further. "The Chinese government did a 'lessons learned' from the demise of the Soviet empire," Smith says. "[They] saw what the backbone of democracy and freedom was​ — ​by and large it was church people." Shea adds that Beijing's harsh repression reflects the Chinese government's terror that the free exercise of faith could topple a regime without warning. What's to be done? The USCIRF's staff expert on China, Scott Flipse, notes that the problem is likely to intensify in coming months: The regime is working to formulate a new policy on religion before China's presumptive president, Xi Jinping, takes over in 2012. What to do with China's estimated 60 million Protestants​ — ​who are growing both in number and in their perceived threat to the regime​ — ​will prove to be Beijing's major challenge. The Holy See, too, is said to be mindful of China's 2012 leadership change, with some advocating a "wait and see" approach. Yet a few serendipitous leadership changes have already taken place. The previous head of the Congregation for the Evangelization of Peoples — which oversees relations with China, and of which Cardinal Zen has been highly critical — submitted his resignation, as required, upon reaching the age of 75 last month. The pope swiftly replaced him, naming Archbishop Fernando Filoni, who is described as a "China expert," to the post last week. 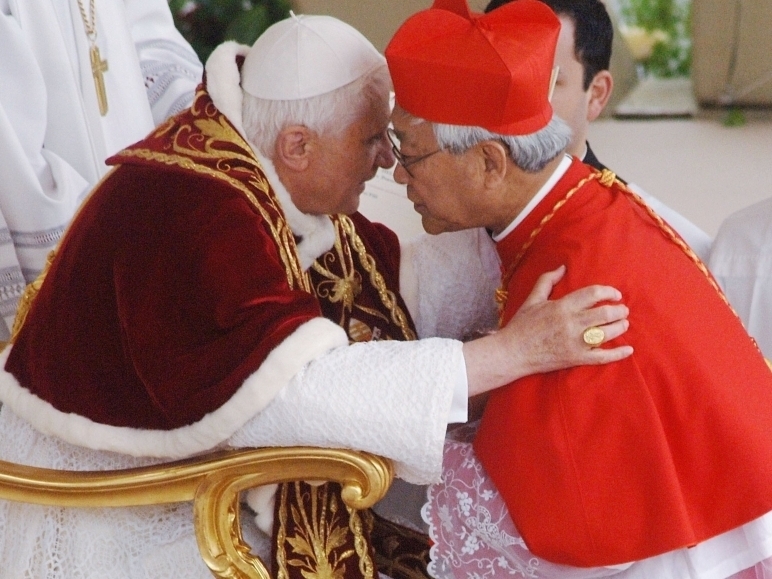 And late last year, Pope Benedict XVI appointed as secretary of the congregation Archbishop Savio Hon Tai-fai — whom Cardinal Zen praised as "a Chinese with very clear loyalty" to the Vatican. For its part, the USCIRF recommends that Washington ratchet up political pressure. "Despite recent strong public statements, the [Obama] administration continues to be perceived as weak on human rights in China," the bipartisan commission notes. Its recommendations to the U.S. government include helping to develop free and secure email and high-speed Internet access via satellite, as well as the "immediate" distribution of counter-censorship programs. Shea advocates visa restrictions on those Chinese provincial leaders who are especially egregious abusers of religious freedom. Smith agrees, saying that the policy should be a "no-brainer." The congressman would also like to see sanctions that punish corporations aiding Beijing's repression, such as Internet companies that turn over information on users to the Chinese government. But perhaps the most important thing is not to mistake China's new savvy for tolerance. "It's right out of the 101 book of how dictatorships get rid of religion: They co-opt it or they destroy it," Smith says. Fewer bloody crackdowns is always a good thing​ — ​but more sophisticated repression is a poor substitute for religious freedom.